Gambit Chess Studio is an app that enables the purchasing and reading of Gambit chess books in a convenient electronic format. An on-screen board allows the chess content of the book to be viewed, meaning a physical chess set is no longer required. For example, if you have finished playing over a side-variation there is no tedious re-setting of the position – just one tap on the screen restores the main line. Or tap on any chess move in the book, and the position instantly appears on the screen. Once you have bought and downloaded a book via Gambit Chess Studio, it’s stored on your device. So it is easy to access your Gambit chess library when travelling, even without an Internet connection. The app itself is free to download from the Apple.com store (for iPads and iPhones), or the Google Play Store (Android devices), and a free sample is available for downloading. From within Chess Studio you then select which Gambit books to purchase from the in-app bookstore. Currently the latest version is 2.1. Details of the new features available in this version can be found here. Our Gambit app books page shows which books are currently available for Chess Studio. App titles currently in preparation are included in the Forthcoming Books section. This screenshot gives a detailed view of Gambit Chess Studio in operation. The text of the book appears on the left, and the live board, which shows the current chess position, on the right. Below the live board is the variation box, which shows any alternatives in the current position. If you touch anywhere in the text area, then the live board will show the position at that point (provided you are within a game); additionally, the most recent move is both highlighted in the text area and executed on the live board. There is a slider to the right of the text area which can be used for large-scale movement through the book. For small-scale movements you can swipe the text area up and down. If there is a branch, then the possible continuations are displayed in the variation box. Just touch the one you want to follow. The variation box can display a maximum of four lines at any time; if there are more than four variations, a scroll bar appears to the right of the variation box and you can swipe up and down to find the variation you want. Other functions are available from the buttons above the diagram. The left and right arrows function much like the ‘back’ and ‘forward’ buttons on a browser. If you have previously followed a link, for example, pressing this button will take you back to the start of the link. Chess Studio remembers various actions, such as touching the screen to display a move or following a link. You can use this button to step backwards or forwards through these actions. The third button brings up a list of the ‘chapters’ in the book so that you can jump to a specific chapter. The button on the right is the one to use if you want to search for any text in the book. You can also search for chess moves. 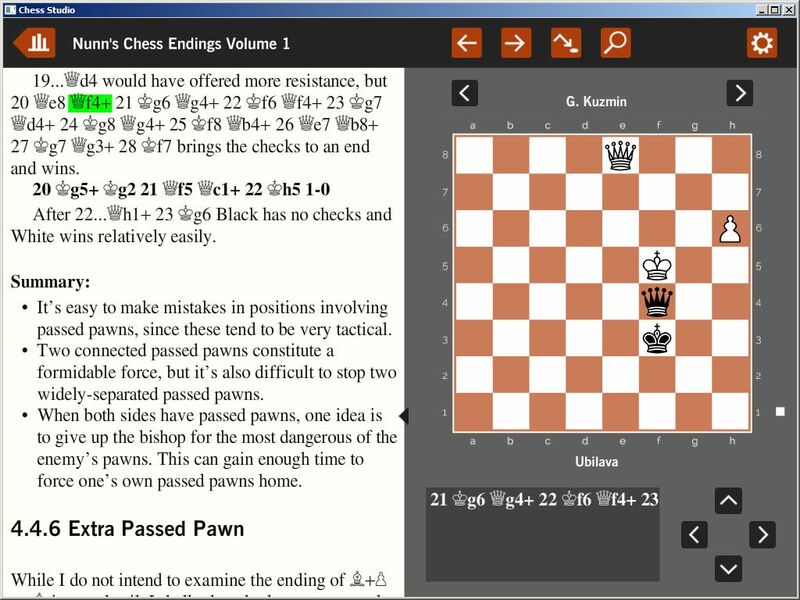 Chess Studio isn’t just a PGN reader. 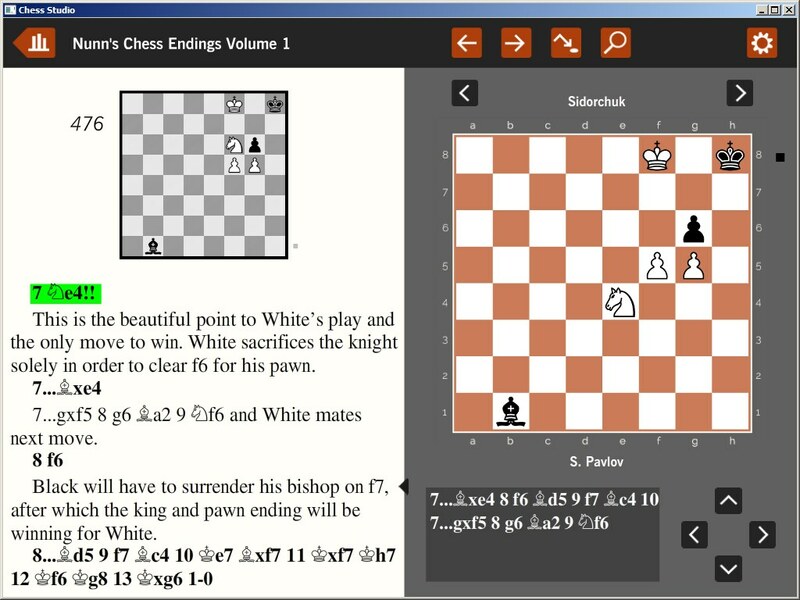 The app uses a proprietary format developed by Dr John Nunn which includes font and text style information as well as chess moves. This allows the app to display text using a wide range of formatting options which emulate (so far as is possible given the screen size) the appearance of Gambit printed chess books, which are widely praised for the clarity of their layout. Chess Studio has many other features which you will discover as you use the app. Why not go now to the Apple App Store or Google Play Store, download Gambit Chess Studio and try out the free sample?